Statistically, Caracas, Venezuela is the most dangerous city in the world. The homicide rate in Caracas is 120 homicides per 100,000 people. That means that everything else being equal, residents of Caracas have approximately a .12% chance of being murdered in any given year. However, if we were to plot that percentage on a pie chart, it would barely show up. One tenth of one percent amounts to little more than a straight line. That's not to diminish the very real danger of living in Caracas, but to point out that even in the most dangerous city in the world, residents have a 99.88% of not being murdered this year. In the United States, St. Louis holds the dubious distinction of being America's most dangerous city. Its homicide rate is 60 per 100,000 people, exactly half of that in Caracas. Everything else being equal (which I know it isn't), people in St. Louis have a 99.94% chance of not being murdered this year. On the one hand, that doesn't sound too bad. On the other hand, imagine that homicide rate on the average high school campus. In a school of 2,000 students, two would be murdered each year. How many parents would feel comfortable sending their children to that school? For the last four years, my family and I have lived in Horry County—a few miles south of Myrtle Beach. The homicide rate here is somewhere around nine homicides per 100,000 people. 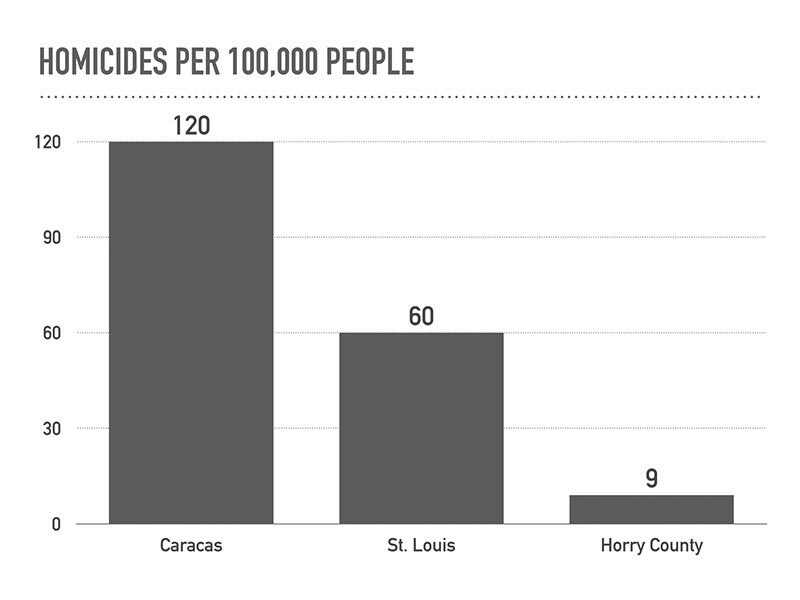 The graph below shows how its homicide rate compares to that of Caracas and St. Louis. Though Myrtle Beach has a higher-than-average crime rate, it is still a relatively safe place to live—unless you happen to be living in your mother's womb. In 2014, 57,631 children were born in South Carolina and 5,714 were aborted. By that metric, unborn children in South Carolina have roughly a 9% chance of being killed before they're born, but it's actually worse—because quite a few South Carolina women go to Georgia or North Carolina to have abortions. All told, South Carolina women had 9,033 abortions in 2014, which means that 13.6% of unborn children in South Carolina were killed in the womb that year. In California, where I was born and my children were born, unborn children have a 27% chance of being killed in the womb. Nationwide, 19% of unborn children are killed in the womb. For black children living in the womb, close to one in three is killed by abortion. 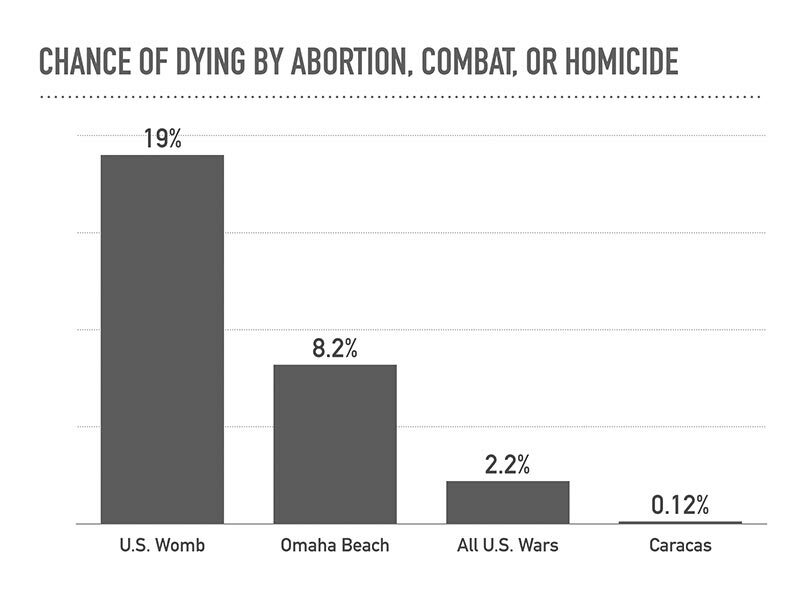 In terms of scale, abortion is unmatched by any other atrocity in the world. The only thing that kills more people than abortion is old age, and even though abortion systematically targets and destroys the most innocent and helpless members of the human community, hardly anyone notices or cares. It is barely mentioned in most schools, it is barely mentioned in most national news coverage, and it is barely mentioned in most churches. Why? Because abortion is legal, lucrative, and extremely controversial. This certainly isn't the first time I've heard such concerns, but my opinion is this. His son should be freaking out about abortion. We all should be. The fact that we adults, many of whom count ourselves the ambassadors of Christ, can go about our daily business with nary a thought to our unborn neighbors, who are dying each day en masse, is a testimony to just how desensitized we’ve become. When children hear about abortion for the first time, they're horrified and dumbfounded. How can this be happening?! Tragically, by the time they reach college age, far too many have been conditioned to accept the unthinkable. Far too many will follow the lead of their Christian parents—who are nowhere near as freaked out by abortion as we should be.